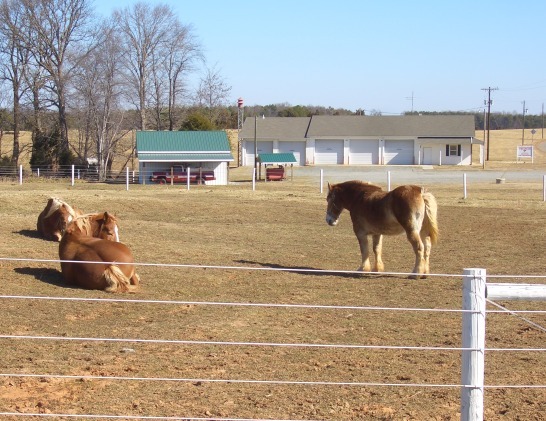 Halifax County on the NC/VA border in southern Virginia is home to a tiny Amish community. On my recent Amish trip I paid a brief visit. 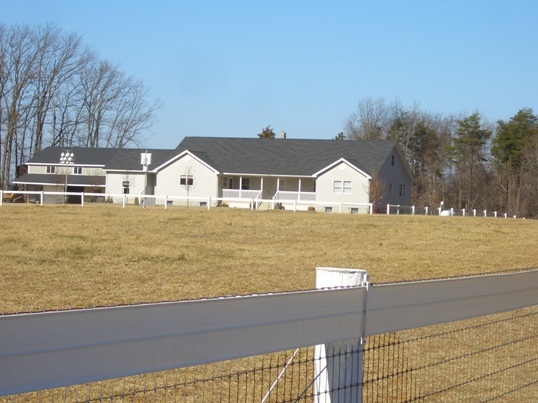 Halifax County is one of just 4 Amish communities in Virginia. 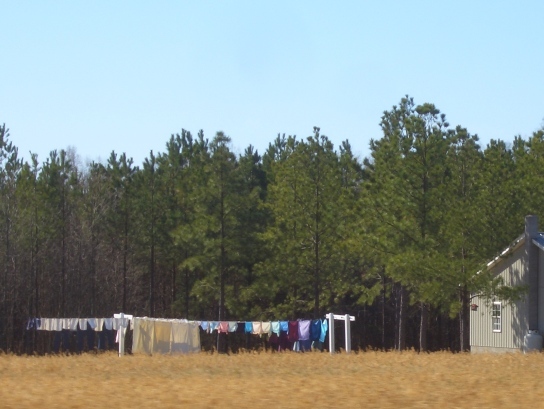 If you missed it I shared some photos of one of the others here: Charlotte County, Virginia Amish. 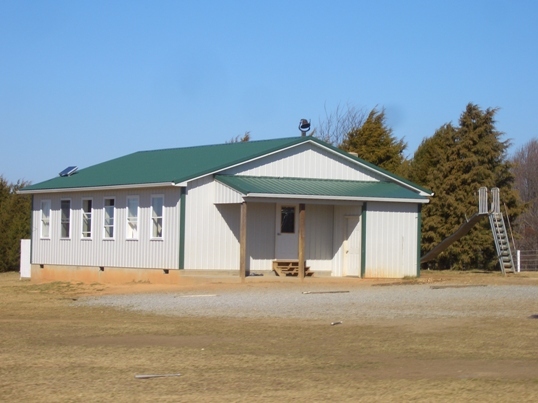 The Halifax County community was founded in 2005, and is a single church district in size. There are probably no more than a dozen Amish homes if that many. The center seems to be a rural “intersection” or really just a fork in the road, with the school and many of the homes clustered nearby. As in many other communities, Amish here operate a variety of businesses. Halifax County is well off the beaten path, but the folks here seem to be getting by pretty well. This is wonderful news. A relatively close Amish community. I can only hope that they continue to spread and florish. Good morning. Nice job with the pictures Erik,it has to be tough when you dont have alot to work with. And i mean a good amount of Amish homes, and the Amish themselfs in this very small settlement.Everyone have a good day. Richard.Pennsylvania. Beautiful pictures Erik!! I am going to have to get a map out and see if that is near where Frank’s sister lives. Maybe we will get a chance to drive by when we are out there for the family reunion? That would be pretty cool. I have to map the route we will take one of these days then mark all the Amish communities along the way, LOL. I have so much respect to all Amish people. It is amazing how neat and well kept Amish farms are. Everything is very well organized and in order. Rest of us can learn a lot and i belive much more. Hope for them to flourish. Everything from their homes to the fields and schools are always so neat and clean. It shows the appreciation they have for what they own. Thanks for the pictures, Erik! 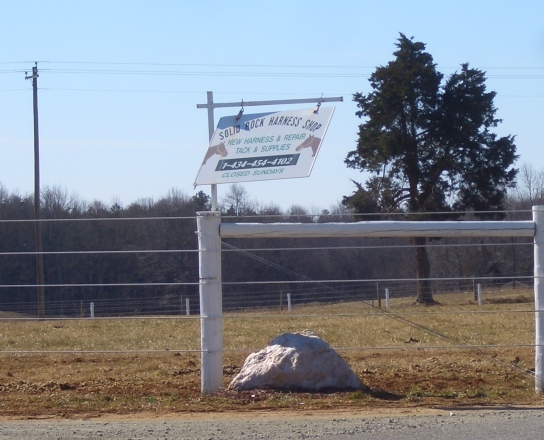 Erik, was that a rock next to the sign for the “Solid Rock” Amish harness shop? Which came first,I wonder, the rock or the name of the shop? (Or is it an unmelted pile of snow? I can’t tell from the photo…) Or is it just an Amish pun? I’d sure like to visit and pick up a quilt and some eggs. Alice Aber there is also one more Amish community of decent size, in Pearisburg VA, but that is closer to the mountains. I’ll actually have a (short) VA state guide entry out soon. Hi Cheryl, thanks for your question though I don’t really know what the midwife situation is in the communities relatively near to you. The VA community at Charlotte Court House originates I believe from the St. Mary’s County MD community, which is itself out of Lancaster, but a plainer group. Plainer groups tend to make more use of midwife and non-hospital birthing. There is also the community in Halifax Co but both of these are quite small. The bigger issue for you is that there are simply no Amish communities closer than about 2.5-3 hour drive from Newport News (St. Mary’s County is about that distance and medium-sized at 1000+ population). Very familiar with the St. Mary’s County community. I grew up not far from it. It’s about a 4-hour drive from me here in Hampton Roads. My daughter graduated from St. Mary’s College of MD. The St. Mary’s communities drive the grey, Lancaster style buggies. Does the Halifax community drive the black, enclosed buggies used in Delaware? Those are almost creepy looking; reminds me of a hearse. Hi Erik and all…Besides noticing the rock, I also noticed the wooden baseball bat in the school yard photo. Another Amish fixture it seems! I signed up for your daily blog a few weeks ago. I sell products online for an Amish business in Lancaster County Pennsylvania and wanted to learn more about my wonderful business associates. I cannot tell you how much I enjoy your daily missives and accompanying photos. You are really helping me to understand and appreciate my Amish friends. Hi Margie you are very kind, and I’m glad you took the time to leave a comment and say hello. And I’m also glad if this site is of any help. Also very nice to hear you are working with a Lancaster Amish business–now I’m curious what you sell! Alice, always glad if it helps any. One nice thing about Amish migration is that it is getting hard to take any road trips without passing relatively near an Amish community, at least over a lot of the country. Robin sorry you might have mentioned that you knew St. Mary’s County already. Halifax would drive those, but I did not see a single buggy out, or parked, while I was there–not a lot of traffic happening, cars or otherwise. I’d guess they’d mainly take them out when going to town, as most folks are walking distance. I have faxed some of your posts to my Amish friends. I plan to order the Lancaster County Business Directory soon. I sell reel lawn mowers. The Amish company is having these made in China now, which amazes some people. The mower is a model that was made in the United States since 1939. It is a particularly good quality reel mower, much favored by the Amish, and always a best seller for me. About ten years ago the last American company told me they were going to quit making it. I asked them if they could do one more run for me before they shut down operations. They said that another customer had asked them the same thing, and that if the two of us came up with a large enough order they would make another run. He put gave me the Amish company’s phone number. We had another run made. When we both ran out of stock a businessman approached the Amish company with an offer of importing the mowers. The Amish company is maintaining strict control over the quality of the mowers and inspects, adjusts and lubricates each one. They would prefer to have the mowers made locally but have been unable to find a factory that can make them for a reasonable cost. A few years ago I approached the Amish guys with the idea of serving as their wholesale broker and that arrangement is working for both of us, as well as bringing some dear friends into my life. I recently added some beautiful Amish made placemat sets to the site and will soon add some chair pads. Yes, the Amish at Nathalie in Halifax County came from the Dover, Del., area. They were able to do quite well because of the difference in land prices in the two areas. Land around Dover is much higher than in rural Halifax. 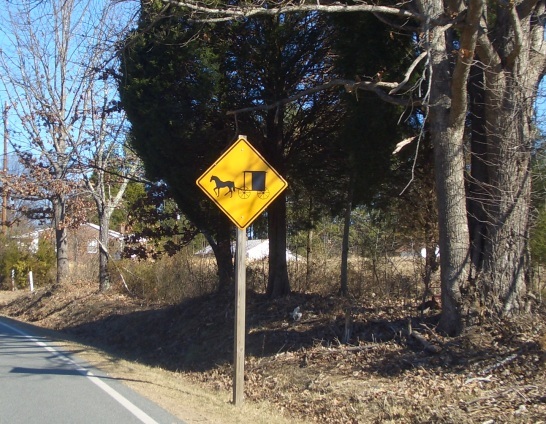 For anyone interested, there is an Mennonite community near Dayton, Va., in the Shenandoah Valley, that are horse and buggy people. There are several businesses including Rocky Cedars store, which deals in books, Plain dress, fabric and patterns, and other dry goods for Plain families. If any of you find yourselves in the South Boston area (of Halifax Co.) around 11 AM on a Sunday morning, you are welcome to attend Ebenezer Mennonite Church on Wolf Trap Rd. off Rt. 360 east of South Boston. Te church is affiliated with the SOutheastern Mennonite Conference, if that matters to anyone. We also have several Mennonite communities in Virginia Beach and Chesapeake. However, they are not horse and buggy. Some I’ve noticed are more plain in their dress than others. They used to operated a couple of dairies in the area but changing times forced them to close after many years … Yoders and Bergeys. However, the Bergeys still run a bake shop, deli and small ice cream operation at the old dairy location. I can buy my Mrs. Miller’s noodles and New Hope Mills pancake flour there as well as preserves and pickle products that they “import” from PA and OH. P.S. Margie, what’s your Website address? I’d like to see the placemats and chair pads!! Thanks! i visit the lancaster amish community several times a year and just admire the lifestyle and the things they make…..
My web site is www.reelmowersetc.com. If you buy these, you will be the first to purchase them from my site. I will offer you and any other Amish America readers a $10 discount on each set. The chair pads are not on the site yet, I hope to add them by the end of this week. I can email you photos though. The fabrics are the same for both sets, so you can get the placemats and chair pads to match. Thanks Margie … I will check it out! Forest thanks for letting us know on Halifax County. I was drawing a blank–and then I just remembered you and I had corresponded a couple years back about South Boston. Seems like a very nice area. Thank you! By the way, I also bought your book “Success Made Simple”. It is pretty busy this time of year, what with southern lawns starting to grow and all, so I have only found time to read a few pages so far, but it looks really good and I am sure it will be helpful. I think I’d like to have one of those mowers. Our yard is small and I’d be more likely to use it vs. the power monster. There are actually several models of the Amish mowers on my site, and I strive to represent them accurately. You may have been looking at the horse-drawn mowers. The frames for these mowers are made by Lancaster Amish welders, and the mower heads – the reels – are made in China. If you look at the push mower pages or the tractor-tow gang reel mowers you will see the statement that they are made in China. The sharpening kits, which work on almost all reel mowers, are likewise of mixed origin. The Amish welders make the crank handles and the snap ring pliers are made in China. I created the “Made in USA” page because so many of us want to buy products made here whenever possible. I put the horse drawn gang reel mowers on there because a good deal of it is made here, by Amish welders, and I did clarify there that only part of the mower is made in the USA. I am located in a remote mountainous area of Northern California and yes, the search for a factory in the USA continues. By the way, the USA company stopped making the mowers because they changed their business focus to making implements that can be towed with an ATV. As far as I know the decision had nothing to do with Chinese competition. Erik, the “Laundry day in VA” picture got me thinking. Could you write an article on Amish winter clothing? Maybe you could focus on what Amish people (men and women) in different communities wear to keep warm in accordance to what is considered plain in different communities and disciplines. I’ve been wondering what they wear to survive snowy winters in northern climes. I apologize ahead of time if this has already been addressed…but how do Amish move? When a family goes to a new settlement, how do they move their furniture, family etc? I don’t imagine they pack up the buggy with the living room furniture (especially if it’s long distance…like out to a Montana settlement). Or do they hire an English moving van and have somebody drive their stuff out to their new place? You would be correct. They hire English to move their belongings. They hire English for a variety of driving jobs. Such as if they have a funeral to go to in another state. Hiring others to move them, drive them to funerals, or even drive them to their vacation destination is allowed and not against the ordnung in many communities. I accidentally unsubscribed, by clicking on the wrong link in the email. I got a confirmation saying I had successfully unsubscribed and then when I tried to subscribe again I got a message saying I was already a subscriber. I don’t want to miss any of your interesting posts – what should I do? By the way, I especially liked the post about the Amish clothing. Hi Margie, I just checked and it looks like you have an active subscription, it’s possible your 2nd try got you resubscribed and the subscription service sent you the mail in error. But if you don’t get posts next week (Mon or Tues) let me know. Thank you Erik! I hope you have a great weekend. I will be traveling in 2 days to this area and was hoping for some exact directions so that I can ride through this Amish Community in Halifax county. Could you supply me with that? Thanks so much. Wendy, try Hunting Creek Road–there should be a few Amish businesses in that area. It’s a small community though. 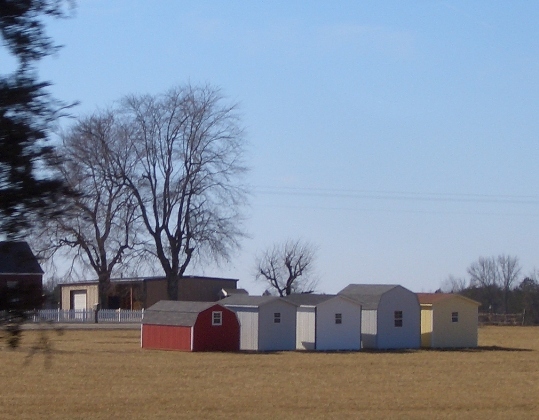 I am interested in an Amish built shed. Do you have contact information for the builder of the sheds in your picture? Do Amish allow visitors in thier community or talk about there ways? And can u be welcomed into thier community as being part of lives? As a whole the Amish people keep to themselves. And live the “plain” life. And venture out for work or needed items i.e. groc. or lumber. They normally don’t strike up conversations. But if you talk to them they are willing to get to know you and then would likely share about their lively hood. As far has accepting you, they will befriend you. As any other person. But to be completely accepted one would have to turn from the ways of the world and live has they do. It seldom “almost never” happens though. I have may Amish friends from the Halifax community. And I work with a fair number of them. And some accept has a good friend. And I accept them just as much so. 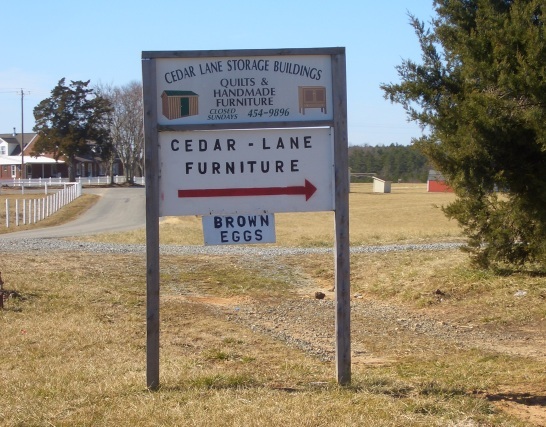 I live in Aldie, VA. Is there an Amish Community which includes wooden furniture repair? i am actually a french girl travelling in the US and I am very interested about what are doing the Amish people. Thank you for this very interesting website ! I was wandering if it was possible to visit them, and if yes, where should I go ? Well Lucie you. can go out to Nathalie, Va. And look for a house with out an electric pole. Or go to windmill farm bake shop; in Halifax. Some work their. Two groups of 10 business students from Berlin, Germany visited Nathalie Amish in October 2014, & again in 2015. They were interested in the three one-room schools, the closeness if Amish rural family life,telephone sheds, woodworking, Hilltop Store, Byler’s Belgian horses, and the general layout of the community. The children sang in Pennsylvania Dutch & the German students responded with refrains in German. Dr. Andrea Mehrlander worked with two Virginia colleges during 2 week visits to the US. Two groups of Virginia students took corresponding trips to Berlin. 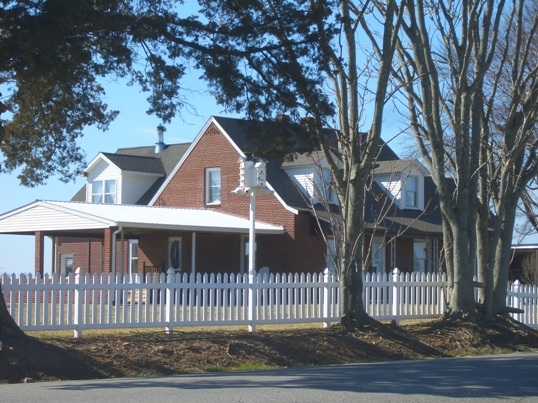 Almost 60 families now reside in 2 church districts in the 10-year old growing northeastern Halifax County, VA Amish community. In March 2017, a group from Netherlands goes to Richmond VA, for a Conference. Is there near a group Amish where they maken Quilt and sell ? There is possibility for a buggyride or something like that ?